Today's paper mills have been targeted with aggressive up-time requirements to keeping them running as efficiently and profitably for their shareholders as possible. Once such technology that has quickly crept into paper mills over the past few years has been the flexible disc coupling. 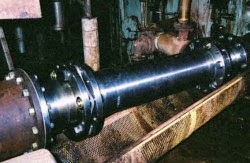 Whereas gear couplings have long been used, and require system shutdown for coupling inspection and re-lubrication, disc couplings (paired with a steel mesh coupling cover and strobe light) can be inspected while running. Furthermore, they require no lubrication and have a theoretical infinite life. A stumbling block that Lovejoy has seen with disc coupling installations at various mills is that they have selected a disc coupling with misalignment limitations far below what the given system actually sees. Under such circumstances, the disc coupling will quickly fail and the operator will question why they even bothered trying to switch. One of Lovejoy's veteran sales personnel documented the case of a specific east coast US paper mill going through a disc coupling every ~90 days in the dryer section of the machine. The failures caused production stops of an entire shift, with economic consequences that were certainly being felt by upper management. Broadly speaking, paper machines are comprised of two main areas (a wet area and a drying area), and can have somewhere in the range of 100 to 125 processing pumps supporting a single machine. 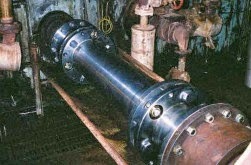 Advanced scalloped disc pack coupling designs (such as Lovejoy's offering) offer considerably more misalignment capability relative to traditional early iterations of the disc coupling, and are generally well suited for many paper mill applications. Even when utilizing scalloped disc pack designs, it remains critical that installers understand and work actively to mitigate the inherent misalignment in a given system. Disc couplings are beautiful, in that, when well aligned, they have a theoretical infinite life (no wearing parts) and can last 10 years or more. And regarding the competitor disc coupling that had been failing rapidly above, the Lovejoy sales rep reported back to Lovejoy that, after 3 years, the new Lovejoy disc coupling was still running well. That's certainly dollar signs and peace of mind to the supervisors of the plant in question! To learn more about flexible scalloped disc pack couplings, please visit Lovejoy's product page and/or download their PDF product catalog.